Sarah's pick of the Autumn trends to look for. Ok so it is only mid August but the Autumn collections are arriving daily and I know many of you like to get an idea of the trends early on. Here I have chosen three trends which are going to be huge this autumn and ones we have bought for our shop and website. These are not the divided skirts you might be imagining. These are more like a wide leg cropped trouser. Once we get accustomed to wearing these they will move onto slightly fuller leg shapes for winter and they are also everywhere for spring summer next year. They look great with heels, be it a court shoe, an ankle boot or a long boot. These will look best with a narrower leg trouser or skinny jeans. A poncho or cape is perfect for that in-between summer and autumn time when a big coat is too warm. I plan to wear mine on the school run as I can pop it on over my jeans and head out of the door quickly - great for wearing in the car. 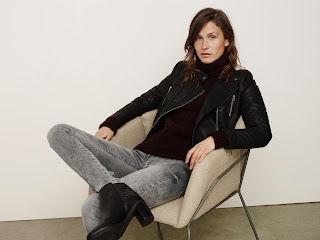 Leather, PU, Pleather - whatever we want to call it, appears on trims of tops or is seen as an A-Line skirts, shorter length tops or biker style jackets. We are adding new styles to the website and to the shop floor everyday. So please pop in or log on regularly to see the new arrivals. You could also like us on Facebook too for regular updates. Enjoy the rest or your summer and we look forward to showing you the new collection.